In the 18th century, the quarter of Jakomini was a suburban zone, where baron Caspar Andreas von Jakomini erected many houses along Jakoministraße, Schönaugasse and Klosterwiesgasse around 1790. These houses had a workshop area on the ground floor, a courtyard and habitations on the first floor. It was never a pure shopping street but a street with a lot of services. Since these – in former days prospering – streets had become a problematic area with a lot of empty spaces close to the center, the department for tourism an economics attempted to reanimate this quarter. And together with the Creative Industries of Styria they tried to focus the initiative on the creative sector. The structure of the project included three divisions: a subsidy towards the rental for designers who want to open their studio in one of the empty spaces, a so called „visual frame“ to recognise the area and the coordination of the whole project. The „visual frame“ was the result of a competition of 28 designers. „Ready, Steady, Go“ was the project realised by Sandra Janser und Elisabeth Koller, two young architects. They laid a red running path around the block with the traditional marks for start, races and goal. When it was presented in the yearly design festival held in the month of May, “Design Month”, 2010 it provoked a huge media response not only in Graz but also internationally. The area became famous literally from one day to the next. Additionally, this project contributed to establish a dense network between the photographers, the grafic designers, the architects, the multi media artists etc. in the quarter. After the end of the project in 2013 a local association, founded in 2014 attempt to pursue the activities. The role of design was very important in each stage of the project. The visual frame of the project was an important example of Design in Public Spaces in Graz. In the course of Design Month Graz 2010 the project “Ready. Steady. Go!” by the architects Sandra Janser and Elisabeth Koller won the first prize in the design competition for the installation of a visual frame in the Jakomini district. The intention of this visual frame was to define the streets Jakoministraße and Klosterwiesgasse in order to mark them as a significant design area and give them a visible and positive identity. These changes attracted attention in the quarter and made people stop and absorb the newly created atmosphere. 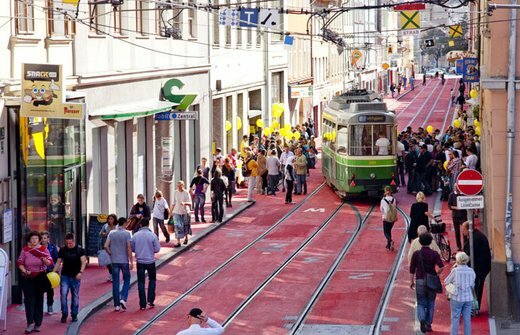 A total of 750 meters or 4600 square meters along the streets and pavements around the block were coloured in red, grey lines separating the tracks. The programme encouraged the creative branch to settle in the district and promoted activities to increase the attractiveness of the Streets.